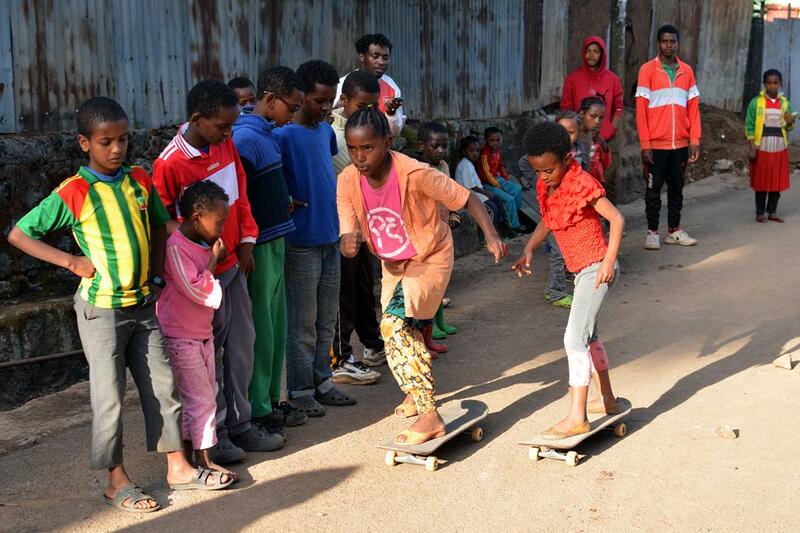 Israel Dejene Male is the founder of Love in Action – Ethioskate, a community organization for youth that he runs with his siblings (especially his sisters Muluken and Elsa). 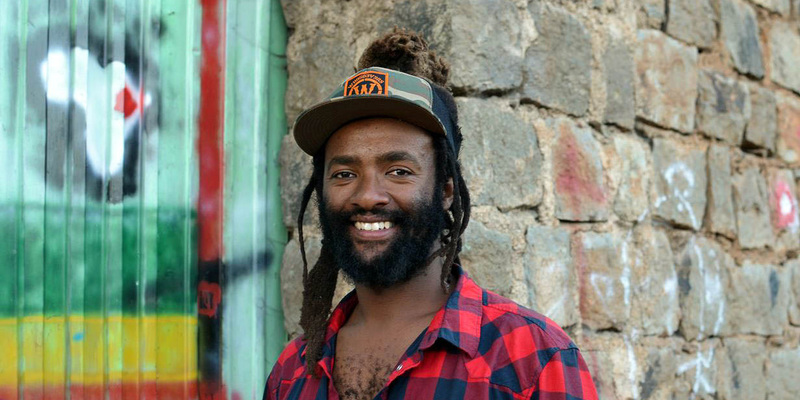 Israel is a talented Ethiopian musician who visited Sweden to perform, where he picked up a skateboard after having followed the sport for years. 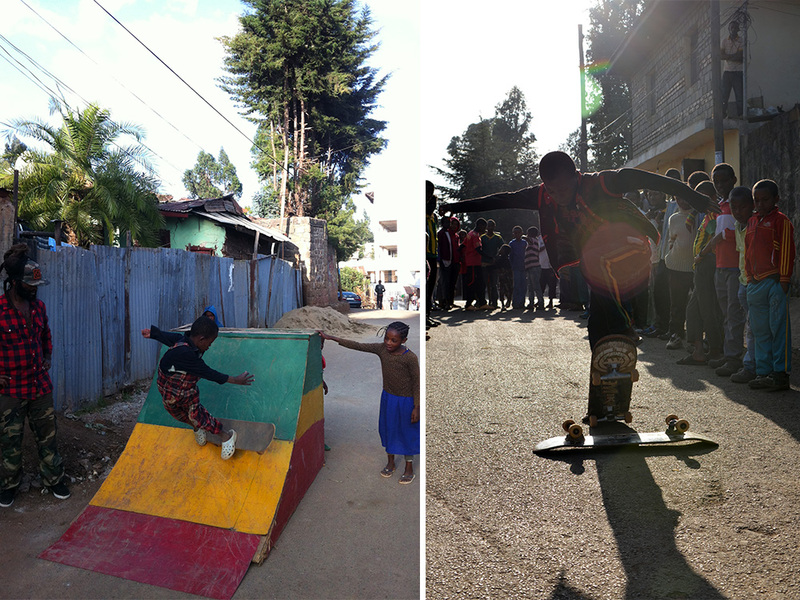 He returned to his childhood neighborhood Shiromeda, in the foothills of the Entoto mountains on the outskirts of Addis Ababa, and the instant popularity of the couple of boards he brought back turned into a full-blown organization providing about 30 local children (up to 60 when there are enough boards) with motivation to dream and access to Addis Ababa’s only skate ramp. 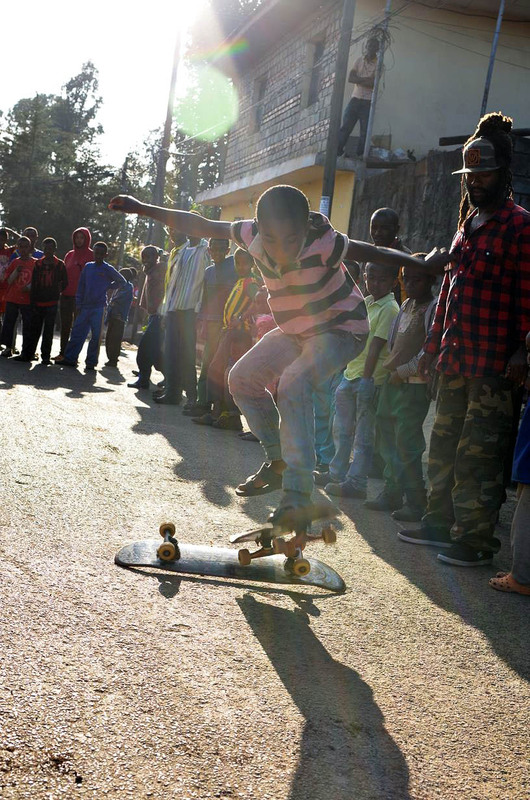 The organization consists of skateboarding sessions, skateboarding trips for youth who rarely get to leave the city, service for the community, local skate performances, goal and dream building sessions after every session, and visits from motivational guests such as doctors, musicians, and more who grew up in the neighborhood. 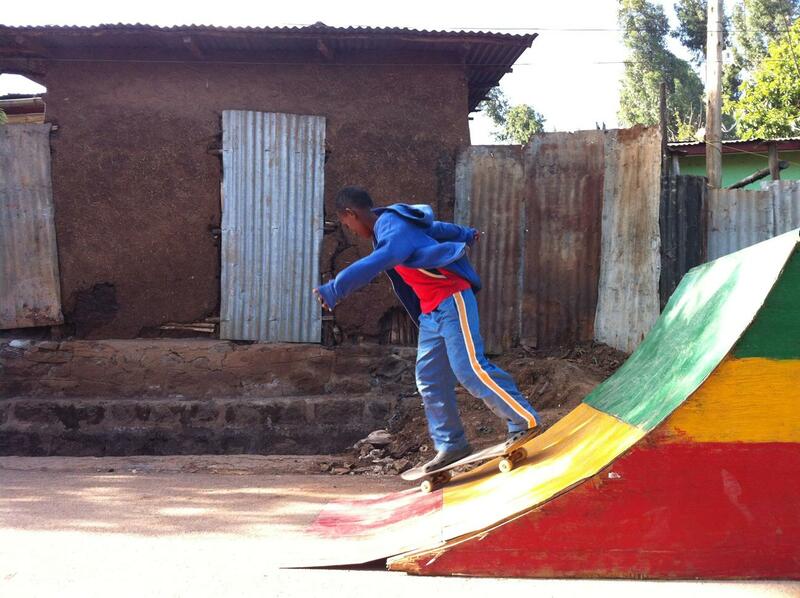 We sat down with Israel for a Q&A on a Sunday afternoon at his home and the base of Love in Action – Ethioskate, and then got the chance to watch the crew skate. Can you explain how this all started? This all started seven years ago, the first time I started skateboarding in Sweden. 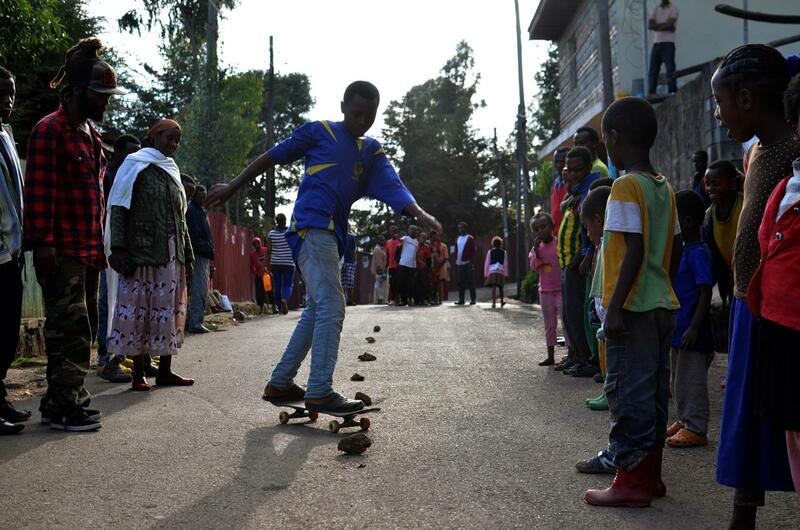 When I came back to Ethiopia I brought one skateboard and I started skateboarding around the neighborhood and different parts of the neighborhood, and that became a means of communicating with kids on the street to make like a community. 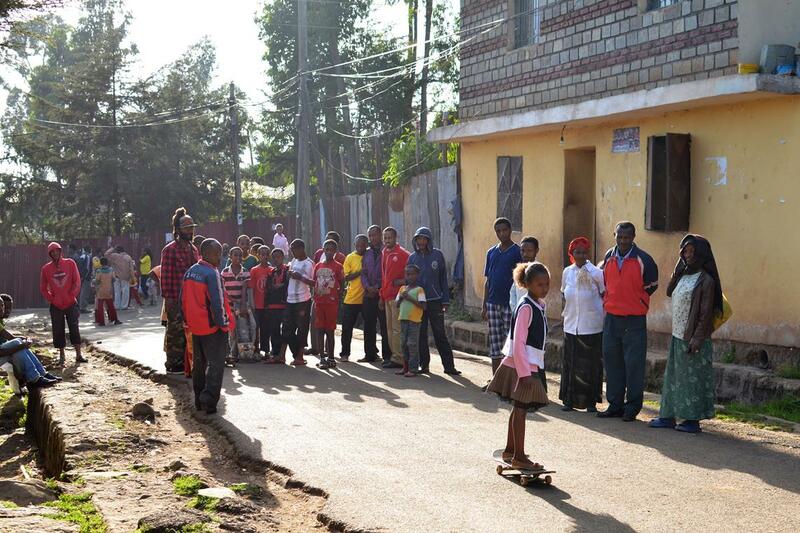 After I brought back the skateboard, I gave it to the kids and I started with that. That one skateboard. It’s been four years. How do you teach the kids? what kind of tricks can they do? I show them what I know and bring some DVDs. They do the ollie and the shove-it, they try kickflips. They do the ramp. The ollie is their favorite, but also playing on the ramp. What other things do you do as a group with the kids? Skateboarding is bringing us together and then after the skate session we have different activities. We have this thing called “Skate and Dream Big.” That means we bring the kids and help them be able to see what they want to be. They stand on the stage and do whatever they like, what they want to be. A poet will say a poem. Besides that, we have this experience-sharing program which is like people that have grown up with the same lifestyle and they made it in their life, we invite them here. and we basically sit like kids here on the floor and they share their life story. We had one musician, an amazing dancer, a soccer player, we had one doctor who was an orphan and who has been on the street. What is it about skateboarding? Skateboarding is a really cool instrument that actually brings the kids together. It has got this power that makes people like a family. Once you start skating and being in the skate community, you become like a family to each other, you help out each other. It has this really strong thing that bonds people together. I’ve seen this here among the kids, when they do new tricks they are happy to show other kids. 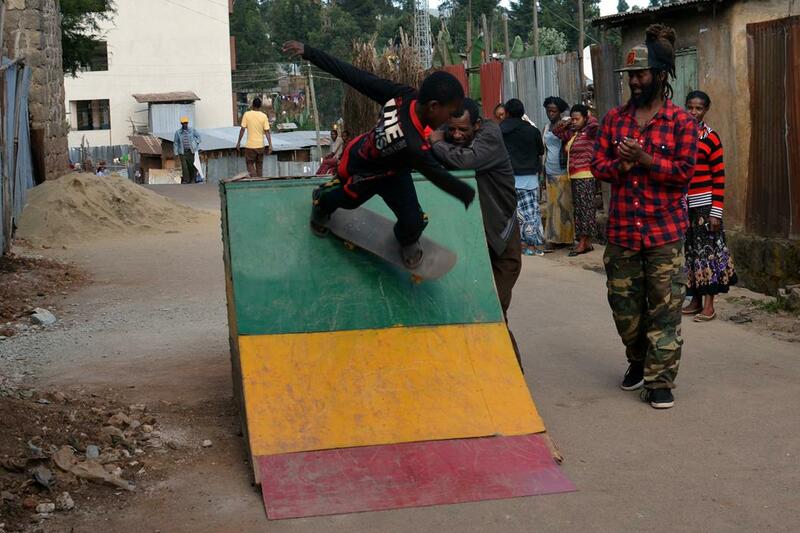 Is the community supportive of Ethioskate? At the beginning, because it’s a new thing and all the kids are from, like, the street and known for different bad behaviors, they didn’t know. But we have different activities — after the skate session we started community service helping the elderly mothers and cleaning the area and helping around the community. So the community started to see like, “OK these guys are doing something positive, something good. The kids are having an amazing change in their behavior.” So they started to be supportive and they started to come and ask me different questions, and right now they are very supportive. Sometimes, like when we have special sessions skateboarding, they will be around like an audience helping — if there is a car coming, they will stop the cars. They are happy right now, we are making a difference as well. Actually, to get an acceptance with the community was the biggest challenge. We were skating on the asphalt road here and they didn’t know what it is. Even the police didn’t know what it is at the beginning when we were just a few kids. I just wanted to help them, and we started skating outside, and others would say like, ‘Oh no you cannot skate here, you are destroying the asphalt road,” because they weren’t sure if it was going to erode the asphalt road. 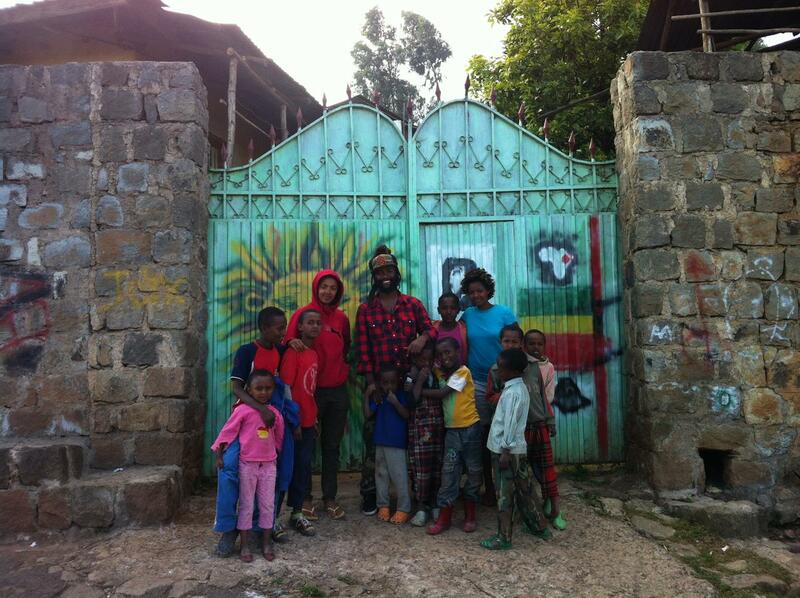 But after a while, just seeing the kids, that started to change the way of thinking of the people. What’s a good moment that you can think of that made you see this was very rewarding? The first time, I don’t want to mention the name of the kids, but he used to be like a very known stealer. and after spending so much time with them, they started to tell me they were really hurt, how they feel, how people don’t pay them attention. I remember once I gave them a key to my room and I went to another meeting downtown. By the time I came back here … my room is really messy, and they cleaned everything. They put every valuable thing I have in order and everything. When I came back I couldn’t believe it, I started crying. I just trusted them and they became trustworthy. Everybody is the same, you know? They just need someone to trust them and give them respect. That was an amazing moment. I want to have different programs like different classrooms, a proper place for the kids to stay and for the art shows and music rooms and for different creative rooms for the kids where they can develop their skills besides skateboarding at the same spot. Skateboarding is going to be always the core. And we are building a park. Do you think outside of Ethiopia or Africa, that people have a misconception about anything? There are so many. Just seeing these kids, there are so many talents and so many things and sometimes the world doesn’t see this side of the country. 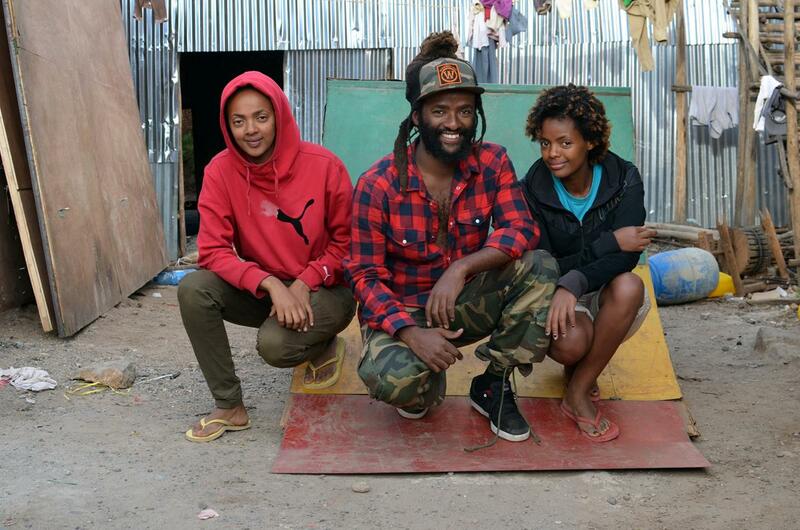 There is a positive side of it, where there are people who are actually making a difference and amazing talented kids and like, people in Ethiopia are not always in hunger, you know? 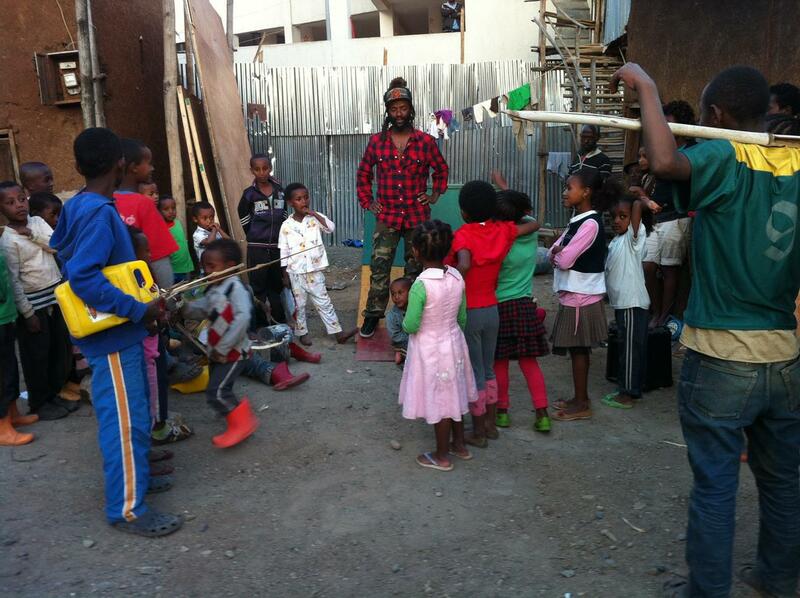 I went to the music school to do a workshop about Ethiopian music. and they say, “Wow you are not skinny!” They only saw on the media in the ’80s during the famine and everything. But there is positive change here. There are people making a positive impact among the community and amazing talent among the kids. If you could have a sitdown dinner with anybody alive or dead, who would it be? With my family and my skate kids. 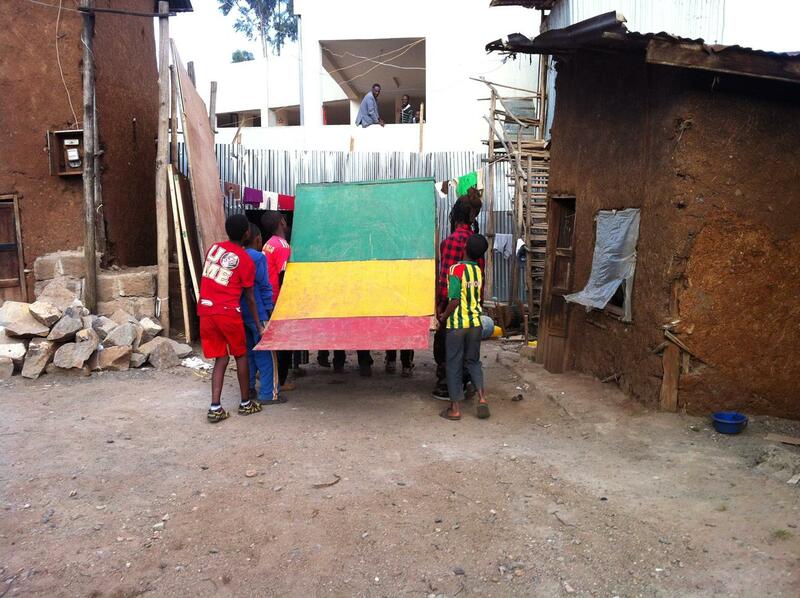 UPDATE: Since we met up, Love in Action – Ethioskate has made the country’s first portable skate park and is in the process of installing a concrete skate park in their Shiromeda neighborhood.